Esposizione Palace Hotel is located in a historic building in Via Nazionale, a splendid example of neoclassical architecture, right in front of Palazzo delle Esposizioni. 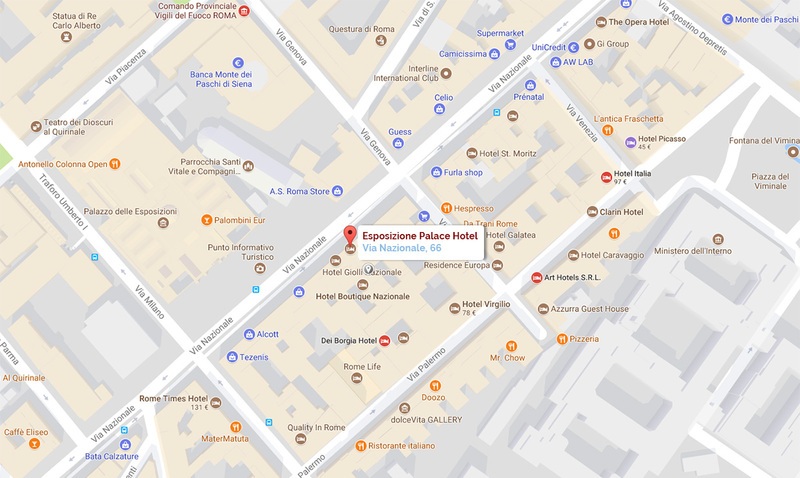 The hotel rises up in the heart of the Eternal City, across the most commercial and elegant street of the capital, exactly in the center of the triangle formed by Piazza Venezia, Piazza di Spagna and Fontana di Trevi. It’s also at a few steps from Piazza della Repubblica and Termini Station and certainly it’s the ideal choice for both an unforgettable Roman holiday and a business trip. Surrounded by the most glamorous bars, restaurants and cafes of Rome, it is also bordered by the characteristic Rione Monti, the oldest district in the historic center of Rome, where the great Giulio Cesare was born. As tribute our Prestige Room it’s called as the greatest character. Today, with its historic shops, its traditional pubs and wineries is one of the most evocative neighborhoods of the Eternal City. The "Leonardo Express" train connects Fiumicino Airport to Termini Station in 32 Minutes with scheduled departures every 15 minutes (in some time slots every 30 minutes). The service operates daily, departing from Fiumicino Airport from 6:23 to 23:23, and from Rome Termini from 5:35 to 22:35. It is also guaranteed during a strike with a replacement bus service and the price of a simple travel ticket, valid for a single trip, is 14 euros. All trains are equipped with dedicated seats and bathrooms for people with reduced mobility. Taxis are available at the airport arrivals area and the fixed rate for the center of Rome is 48€. It is recommended to take only white taxi cabs that exhibit regular license. At the Airport Arrivals Area, there are also COTRAL buses direct to the Terminal of Rome Metro "Anagnina" Line A (15 minutes). Take the train towards "Battistini" and get off at "Termini" stop. Taxis are available at the airport Arrivals area and the fixed rate for the center of Rome is 35€. It is recommended to take only white taxi cabs that exhibit regular license. At the airport you can rent a car at the major car rental companies. Exit from Termini Station, take line 64 in Piazza dei Cinquecento or line 170, get off after 3 stops on Via Nazionale and continue on foot for a few meters until the 66th street. Taxis are available at the exit of Termini Station in via Giolitti. It is recommended to take only white taxi cabs that exhibit regular license.